Description: Perideum: The skin is whitish when young, developing orange-brown tints as it matures, and finally becoming orange-brown overall, frequently fissured. Gleba: The interior is white when immature, and brown with white marbling when mature. Habitat: Between duff and dirt October to February, in 15- to 40-year-old Douglas fir plantations. Notes: The close cousin T. gibbosum fruits February to June and tastes the same. At their best, they may equal Italian white truffles, which are often aged by the time they are available here. 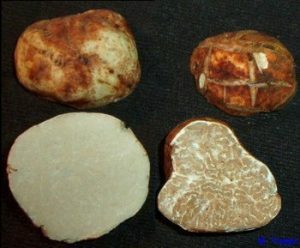 Note the smooth interior and exterior of the young truffle on the left and the marbled interior and fissured skin of the mature truffle on the right. Unless you have a dog, raking will always find all truffles, regardless of their maturity — and they don’t ripen after harvest. Size is also not very important for maturity. Trim chicken breast of fat and thin edges. Cut on angle top to bottom diagonally and lengthwise to create 2-3 evenly thick pieces. Saute shallot in 2 T. butter over medium heat in sauce pan until almost colored. Add Vermouth and raise heat to high to cook off alcohol. Add cream, salt and pepper to taste. Stirring frequently, boil 6 to 8 minutes to reduce by 1/3 or until medium bodied. Remove from heat, add grated truffles, adjust seasonings and keep covered and warm. Add truffle oil if desired. Dredge each chicken piece in seasoned flour, shaking off extra flour. Lightly brown in batches with the remaining butter/oil. Remove to large baking pan in a single layer, top with sauce, and put in 350F oven for 10 to 12 minutes or until internal temperature reaches 165F. Put chicken on serving platter, top with snipped chives and serve immediately.